London: Henry Colburn and Richard Bentley, 1830. 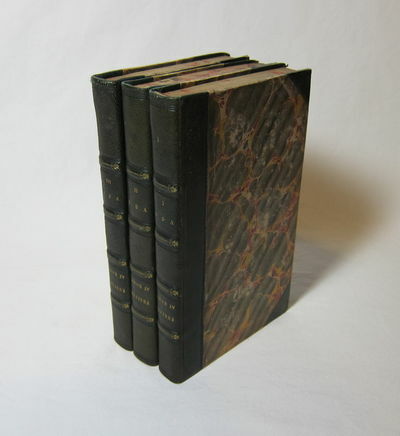 4 1/2 x 7 1/2"; First UK Edition, 3 volumes. Marbled boards with three quarter bound green leather, raised bands and gilt lettering on spine, marbled foredges, amorial bookplate of Ferdinand M. McVeagh on front paste-down of all three volumes, covers and edges show rubbing and wear, in very good condition. Eyre Evans Crowe (1799 - 1868) was an historian and English journalist. Educated at Trinity College, Dublin, his work appeared in Blackwood's Magazine and he had several novels published. As a journalist he was a leading contributor to the Daily News and Examiner with a specialty in continental history and foreign politics. Ferdinand Meath McVeagh (1789 - 1888), born in Ireland, was himself an author of such varied subjects as political satires, poetry, and Irish fiction. He was a collector of fine books and some of his bookplates have been referenced in various auction catalogues such as Christie's.